Order railroad theme personal checks online featuring all types of trains including old steam locomotives, diesel trains, and subway trains. Most styles are available in your choice of single or duplicate checks. 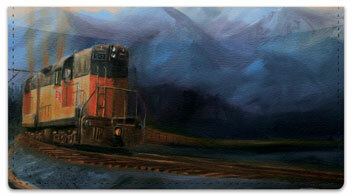 Checkbook covers are also available to match most of the steam train check styles offered. You've got a ticket to ride with these fun vintage checks featuring illustrations of the steam locomotive! 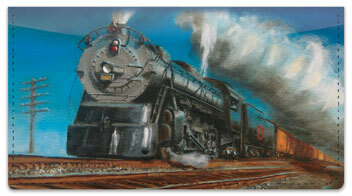 Trains Of The Heartland Personal Checks - Love railroading? These train checks are for you! Locomotives transport goods throughout the heartland. Ride the scenic rails with these personal bank checks. Train Station Personal Checks - locomotives, subway trains, and subway stations all play an important transportation role in America. In these personal checks we see a tranquil setting with a train preparing for departure. Riding the rails has never been so peaceful. The Crossing Personal Checks - The Crossing Painting Personal Checks - This artsy and fun set will have you wishing you were on the train about to go through this colorful world! The bright and bold colors of the painting pop out at you and transfer you to a place of fun. The almost cartoony design will be a great way to bring some art into your everyday life! Here are four personal steam train checks all packed into one checkbook for everyone and anyone to enjoy. 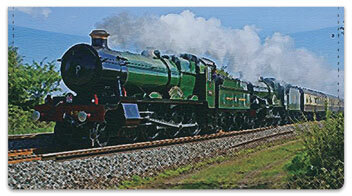 This is a personalized check series specially for those who are interested in classic steam trains. Get this unique check series only at Checks Superstore! Matching address labels and coordinating checkbook covers are available. These Steam Train Checks are sure to please the train buff, as the second part in our train set, these four rotating images display some of the historical giants that crossed our country. Cool pictures from the days of old celebrating the steam engines that brought a nation closer together. Powerful images in black and white. Get on track with these railway themed personal checks. Click to see them now! 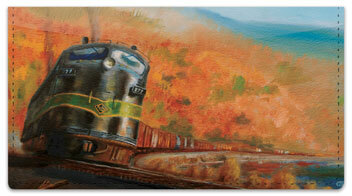 Take a ride on the railroad with one-of-a-kind designs on personal checks from CheckAdvantage! Click to order online or call us today at 1-888-657-9758. You'll hear that whistle blowing when you see these train checks! Click to check them out now! Prairie Fires Of The West Train Checks - Locamotive speed through the prairies that are ablaze with flames. This artistic depiction of the fires that engulfed our great plains during the dust bowl era is a colorful reminder of the hardships our ancestors faced. You'll be nostalgic for days gone by each time you write a check with our classic Old Time Trains check series. These black and white photos of work horses from a bygone era have a timeless quality that's perfect for a train or history buff. Enjoy the best of yesteryear with our matching address labels. Old Time Trains Personal Checks are a must for the train lover. 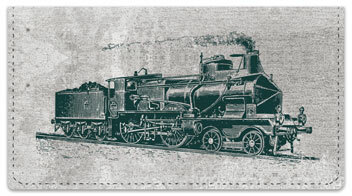 With four old time train photos in black and white making up the background of the check, it is easy to show your love for old trains.The photographs are of the trains in their original glory, including images of the people of that time period having their photographs taken with the old time locomotives. These Old Time Trains Personal Checks allow you to relive your childhood passion for trains, while also having an elegant and clean appearance. Unique imagery on these original personal checks takes you underneath the Big Apple! More Diesel Trains Personal Checks feature 4 pictures of brightly colored trains traveling along the tracks. Trains have revolutionized our society making it possible for supplies and products to be shipped from across the country in record times. These checks are perfect for all train hobby lovers. 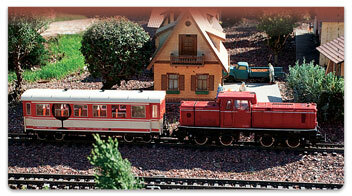 Check out exclusive personal check designs with tiny toy trains. Order your checks from CheckAdvantage! 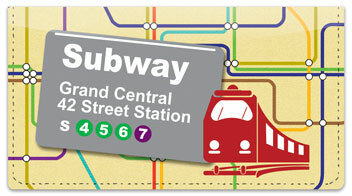 Light Rail Train Personal Checks - Transportation systems are more important than ever. Subways, trains, and light rail are the future. Raise awareness with these artistic personal bank checks. Keep On Chugging Personal Checks - All aboard! This check is a constant reminder to keep your train on the track and keep on pushing forward. Just like the little engine that could, these trains represent that with the power behind the engine, anything is possible! Keep Chugging with these inspirational personal checks! Iron Horse Train Checks - The spread from east to west hit light-speed with the advent of the steam engine. All aboard: These prints will take you anywhere you please, conductor. Fun On The Rails Train Checks - Chuga Chuga Choo Choo!! All aboard the train of your choice with these animated fun on the rails checks! These merry illustrations will get your finances chugging along! Satisfy your fascination for railroad transportation with pictures right out of diesel train history. Travel the Country with this Genuine Leather Train Checkbook Cover! - Capture the excitement of cross-country travel by train when you use this genuine leather railroad checkbook cover. Custom designed to coordinate with your Diesel Trains personal check designs, this striking checkbook cover features Robert West's magnificent painting, Biloxi Bay Crossing on a black background. This exclusive railroad checkbook cover is handcrafted of genuine, full-grain leather. High-quality features include premium nylon thread stitching, fabric lining, a clear duplicate check divider, slip-in personal check pocket, and a second pocket to hold cash or receipts.Don't wait to admire the splendor of locomotives - get your diesel trains checkbook cover from Bradford Exchange Checks! Order now! Train Checks Lead the Way to an Artistic Showcase of the Railroad - Capture the excitement of the railroad from coast to coast with these striking railroad checks from Bradford Exchange Checks. 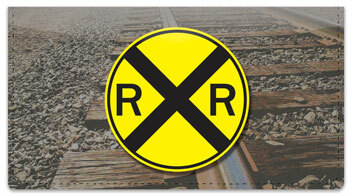 A series of 8 different Robert West diesel train checks feature some of America's favorite trains - Louisville & Nashville , The Champion , Santa Fe , Orange Blossom Special , Baltimore & Ohio , Burlington , Pennsylvania and Atlantic Coast .Plus, you'll find these railroad personal checks are just as practical as they are enjoyable. Brought to you exclusively by Bradford Exchange Checks, they're expertly re-created with premium-quality check printing. Don't miss out on this fantastic opportunity - get your diesel trains art checks as soon as possible! Order now! Pricing shown is for 2 boxes of Singles. This is a personalized check series of old time diesel trains. These trains are still up and running with four of them printed in these personalized checks. Get yours today at Checks Superstore! Matching address labels and coordinating checkbook covers are available. These new Diesel Trains Checks are sure to please the modern day train fanatic. 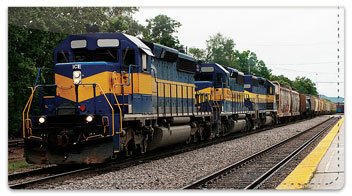 With four rotating images of these monstrous machines, you`ll feel like your in the train yard watching them roll by! 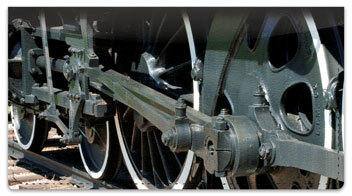 Hop on board with classic trains on unique personal checks from CheckAdvantage. Get exclusive check designs! Ted Blaylock Art Check Designs Transport You to a Simpler Time When People Traveled by Train - Fill your mind with thoughts of simpler times, when steam locomotives were the main mode of transportation with these locomotive art checks by renowned artist Ted Blaylock. All aboard the Blaylock Express , where you can be reminded that life is really all about the journey with these Ted Blaylock art check designs from Bradford Exchange Checks! Four unique detailed designs showcase steam trains in action, pulling into the station, traveling the side of a mountain and more.Plus, you'll find these train themed personal checks are as practical as they are attractive. Brought to you exclusively by Bradford Exchange Checks, they're expertly re-created with premium-quality check printing. Don't let these locomotive art checks leave the station without you - get your Blaylock Express checks as soon as possible! Order now! Pricing shown is for 2 boxes of Singles. America By Train Personal Checks - The locomotive has a special place in history as a major mode of transport. 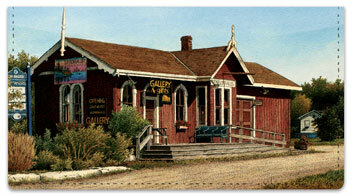 Hauling people and freight, trains have made countless trips across the country and still do today. And although newer and faster ways of travel have come along, the nostalgia for trains lives on. Take a trip to yesteryear and see the countryside from a railway journey with these personal checks.